Personally I don’t hold to this whole global warming thing. Don’t get me wrong, I all for taking care of our environment. I like drinking clean water, clear air is a good thing, no problem with developing new sources of energy. I hunt and fish so maintaining wildlife habitats is a priority. I do believe we need to come up with creative ideas to “clean up” some areas, however some of the current solutions are….well… just plain stupid. One of the dumbest “environmental friendly” developments…EVER…has to be green toilets. 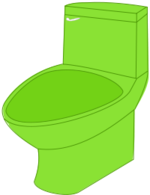 No, no, no, not toilets that are painted green to remind us to be kind to the environment, I am talking about the “low-flow” verity. For years standard toilets used between 3 & 5 gallons per flush. The house I grew up in was built in 1972 and had one of these standard toilets, and boy did it work. You could flush a football down that thing with no problem (I know because me and my brother did). Our toilet was not just the final resting place for a few expired gold fish, but hamsters, gerbils, gunnie pigs and the occasional small dog. Over 35 years in that house and my parents never owned a plunger. Old toilets: Take care of business…heck two or three people can take care of business, flush (5 gallons of water, along with everything else, down the toilet, literally), that’s it, your done…nothing more to see here… move along. New toilets: take care of business, flush….flush again…flush a third time, go out to garage to get plunger, plunge, plunge, flush, plunge, flush, plunge, flush (at 1.6 gallons per flush that is 9.6 gallons of water plus extra carbon dioxide emission from your heavy breathing from all the plunging and not to mention all the noise pollution from your yelling and cursing out the blasted, tree hugging no good #*%#))# that invented this #(@)! thing).